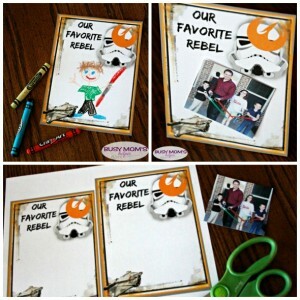 It’s our last day of Craft Lightning, filled with tons of easy Father’s Day crafts – so I’m sharing my favorite one: this ‘Our Favorite Rebel’ Star Wars Father’s Day Printable! Use it as a card or a picture frame for that perfect Star Wars Dad in your life. Customize it how you want, or let the kiddos have a great time with it. I couldn’t resist including Yoda-Stitch and Darth Vader-Goofy in some pics. Y’all know how big into Star Wars our family is, right?! If you didn’t, you sure do now! 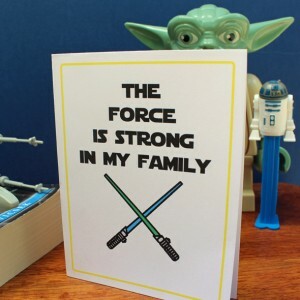 This would go perfect with our Star Wars Father’s Day Gift Bottle Printable Set we shared, to give a little bit ‘more’. I thought about putting this in a picture frame, but then it may cover the fun edges – so I might just glue a little cardboard piece behind it as a ‘stand’ and have it BE it’s own photo frame! I know hubby would love to put it on his desk – or we could just put it above the fireplace for everyone to enjoy. Once you download the printable (I recommend cardstock), just cut it out and either draw your favorite rebel, or tape/glue on a picture. There’s a larger one that’s roughly 5×7 in size, then a slightly smaller one so you can choose which best fits your needs. I absolutely LOVE this Father’s Day Cricut Card from Crafting in the Rain! This Father’s Day Dresser Catch-All for Dad from Stuff-n-Such would be super useful! How cute is this Printed Faux Leather Key Chain from Silly Pearl? Love it! Mother’s Day is coming up and it’s time to show the geeky moms in your life what they mean to you. Moms are a lot like Jedi and it takes some serious skills to do all that they do. This printable Star Wars Mother’s Day card is the perfect way to says thanks. If you think about it, Star Wars has a lot of awfully cool and strong moms. Anakin’s mom, Shmi Skywalker, raised him by herself. She worked insanely hard to give him the best life she could, despite their circumstances. When the time came, she also made the difficult choice of letting him go because she knew that could give him a better life too. Luke and Leia’s mom, Padme Amidala, might not have had the opportunity to show off her momming skills, but there’s no denying that she would’ve been a good mom. She fought for the rights of people everywhere and wasn’t one to back down even when the odds were against her. Luke’s Aunt Beru raised him and taught him the value of hard work. He had to finish his breakfast and get his chores done before he could go hang out with his friends. That’s pretty much how it works in my house too. We don’t know anything at all about Rey’s mom, but I believe that whatever happened to her, she must have made those choices to protect her daughter. As a mom, I sometimes feel like I need Jedi skills to get everything on my to-do list done and still keep my younglings happy. I made this printable Star Wars Mother’s Day card to reflect that. Print your card on regular 8-1/2”x11” card stock. There’s no need to trim it. Just fold the card in half with the pictures and text facing outward. Fold it in half again with the front and back covers on the outside. I like to use a wooden ruler to smooth the edges so that’s they’re really crisp.